With nearly fifty years combined global church-planting experience, Craig Ott and Gene Wilson offer here a comprehensive, up-to-date guide for cross-cultural church planting. 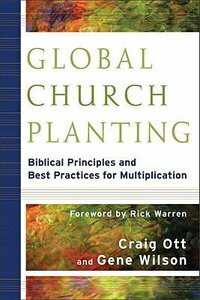 Combining substantive biblical principles and missiological understanding with practical insights, this book walks readers through the various models and development phases of church planting. It emphasizes the role of the missionary church planter, advocating methods that lead to church multiplication. The authors offer helpful reflection on current trends and provide best practices gathered from research and empirical findings around the globe. They take up a number of special issues not addressed in most church planting books, such as use of short-term teams, partnerships, wise use of resources, and contextualization. Craig L. Ott (Ph.D., Trinity Evangelical Divinity School) is associate professor of mission and intercultural studies at Trinity Evangelical Divinity School in Deerfield, Illinois. He occupies the EFCA International Mission (EFCA-IM) Chair, which was established to better link the mission agency and seminary, integrating mission theory and practice. After twenty-one years of missionary experience with the EFCA-IM in Germany as a church planter, consultant, and theological educator, he joined the Trinity faculty in 2002. He is co-editor with Harold A. Netland of Globalizing Theology: Belief and Practice in an Era of World Christianity (Baker Academic, 2006) and is author of Das Trainingsprogramm fr Mitarbeiter (Brunnen, 1996) and most recently Global Church Planting: Biblical Principles and Best Practices for Multiplication (Bakerbooks, 2010) with Gene Wilson.